Hello again! I know, I let one week go by, but I promise I was working on this, and was a little tied with homework ( Working with Flash for my web design/animation class takes an extraordinary amount of time out of my week!) But, I did manage to squeeze this out! I wanted to do a play with color, as I enjoy working with a bright palette. 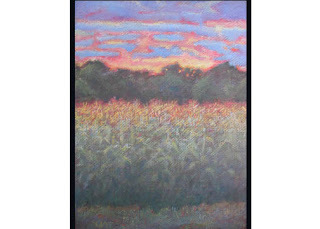 This is a cornfield, of which I took a photo ( No I didnt copy the photo exactly, the colors were a bit to flat!) last fall. Amazing sunset. So, I thought this would be perfect for a color study piece! I'm going to work on a portrait in pastel next...more to come very soon!